Ornon, the ruler of the powerful kingdom of Shadzea, fathered twenty sons. In order to find the one son worthy of inheriting the throne, nineteen of them had to die. Though the life of the Twenty is rigid, Dulok manages to meet secretly with his mother every week. Ornon’s twentieth son has no desire to be the Survivor, the future ruler of Shadzea. As soon as they find a way, Dulok and his mother, a humble kitchen servant named Daynea, will flee the City of Kings for a simpler life. But on a fateful night, as they make their plans, the door to Daynea’s quarters bursts open. 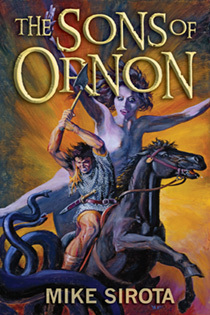 There stands Ornon with Buz, his first son—Dulok’s hated half-brother, who has discovered Dulok’s “indiscretion.” With two soldiers restraining him, with Buz laughing cruelly, Dulok watches in horror as Ornon drives a sword into Daynea’s heart. That night, Dulok’s destiny becomes clear. He will survive the dangerous Princes’ Trials at all cost, so that he might stand on the Day of the Reckoning. Then, and only then, he will destroy Ornon and Buz, and the life of the gentle Daynea will be avenged.